The incumbent Bharatiya Janata Party (BJP) government at the centre marked its third anniversary on May 26, 2017. Three and a half years hence, a number of schemes have been introduced ─ but some key areas of policy planning, implementation and accountability are still lacking within the education sector. Despite efforts by previous governments, India’s education system’s quality struggles with problems of accessibility, transparency, research and innovation. 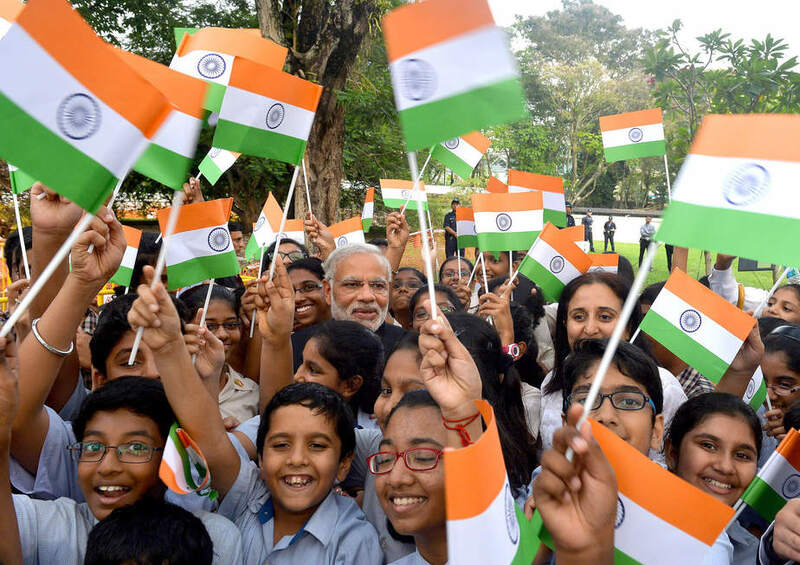 When the Bharatiya Janata Party campaigned during the 2014 Lok Sabha Elections, they promised a clear and detailed plan to rejuvenate the Indian education landscape. The incentives mentioned in their Election Manifesto included improving research in order to bring India up to global standards of education, opening up avenues for digital learning, and further increasing accessibility of school education with special attention to girls, Scheduled Tribes and differently-abled children. Three years hence, a number of schemes have been introduced and progress has been made ─ but some key areas of policy planning, implementation and accountability are still lacking. Under the ambit of the Digital India Programme, the BJP government has taken important steps to create an online learning network ─ one which enables the increasingly Internet-savvy youth of the country to access educational resources despite infrastructural and financial hurdles. The SWAYAM initiative hosts over 300 Massive Online Open Courses that cater to students from the 9th standard to the post-graduate level. In addition, e-Basta, an online library app, makes over 1500 textbooks available to schools. Simultaneously, while internet penetration is increasing across the population, only 20% of the country’s schools have computers. Consequently, as a result of financial constraints and poor network coverage, the Indian masses remain inertial in taking advantage of available resources on the internet. And it’s not only access to the internet. The BJP government’s activity in improving accessibility to education remains inadequate. While the Beti Bachao Beti Padhao scheme was launched in January 2015 to target gender inequalities in schools through awareness campaigns in 161 districts, progress has been slow. Despite the 46 crore funding increase in 2015-16, a Parliamentary panel report assessed that 90% of the allotted funds remained unused, with only Rs. 5 crores having been spent. Similarly, programmes aimed towards children with autism, cerebral palsy, deaf-blindness and hearing impairment (created in collaboration with the World Bank in 2017) have not been integrated into teacher training modules. This leaves education inaccessible for differently abled children. Furthermore, no schemes have been introduced to improve education for Scheduled Tribes; changes in their enrollment numbers have been minimal under programmes set up by previous governments as well. Another important change initiated was the amendment to the Apprenticeship Act, aimed at improving the skills and employability of the Indian youth. The new legislation requires organizations to hire an industry-specific percentage of the workforce as apprentices. It also increased the minimum age to work in hazardous conditions to 18 years. Apart from this, the Act emphasizes practical skills and prescribes a set syllabus for training. However, as per the new amendment, employers can no longer be arrested for violating the act. It also leaves the determination of work hours to the employer’s discretion – these two clauses allow for exploitation. At the same time, industry-academia interrelations are being prioritized, what with the setting up of a Council for Industry and Higher Education Collaboration, along with around 92 collaborative projects having been approved under the pilot programme of the Uchchtar Avishkaar Yojana. The Start-Up Policy under the All-India Council for Technical Education also facilitates mentoring and industrial cooperation for students’ start ups. While academia is increasingly being assisted by the private sector, research facilities remain poor. India remains a small presence on the global education scale ─ with only two universities featuring in the top 200 of the 2016 QS World University rankings. Moreover, a recent move by Jawaharlal Nehru University reduced the number of research scholars from 1,234 to 194 ─ a staggering 84% drop, which was compliant with UGC guidelines. India’s education sector is constantly restrained by the lack of transparency norms. While UGC regulations were revised to specify the rules for the appointment of Vice Chancellors at Universities, the same has not been done for any other faculty in senior positions. It is also worth noting that prominent faculty including Dr Amartya Sen (Nalanda University), RK Shevgaonkar (IIT Delhi) and Anil Kakodkar (IIT Bombay) have resigned in protest against attacks on academic autonomy and other disagreements with their respective governments. 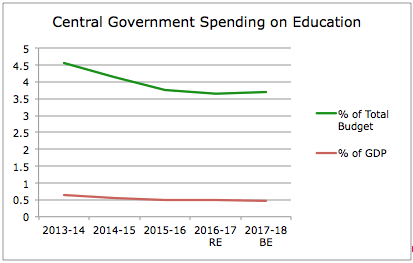 The continually declining allocation of funds to education under the Union Budget does nothing to help the functioning of programmes. Three years in, it appears that the initiatives taken by the BJP government have been largely focused on the enhancement of sectors of education that is supported by the private sector. While programmes like Digital India increase accessibility of education, its reach does not touch pockets of the population that have been consistently denied the right to education for little fault of their own. So, instead of blindly improving educational facilities, in order to truly make education a universal and fundamental right of every Indian citizen, the focus of policy planning must be shifted towards improving social and infrastructural conditions surrounding these marginalized people. After all, this is the same government that promised an undeterred effort towards ‘Sabka Saath, Sabka Vikas’ (collective efforts leading to inclusive growth). Next articleThe Case of the Missing Sparrows: What can be done?